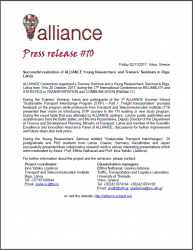 ALLIANCE Consortium organized a Trainers’ Seminar and a Young Researchers’ Seminar in Riga, Latvia from 19 to 20 October, 2017, during the 17th International Conference on RELIABILITY and STATISTICS in TRANSPORTATION and COMMUNICATION (RelStat-17). During the Trainers’ Seminar, tutors and participants of the 1st ALLIANCE Summer School “Sustainable Transport Interchange Program (STIP) – Part 1: Freight transportation” provided feedback on the program while professors from Transport and Telecommunication Institute (TTI) presented their vision on introducing STIP courses to the TTI existing or new study program. During the round table that was attended by ALLIANCE partners, Latvian public authorities and academicians from the Baltic states, and Ms Inta Rozenšteine, Deputy Director of the Department of Finance and Development Planning, Ministry of Transport, Latvia and member of the Scientific Excellence and Innovation Assurance Panel of ALLIANCE, discussions for further improvement and future steps also took place. During the Young Researchers’ Seminar entitled “Sustainable Transport Interchanges”, 20 postgraduate and PhD students from Latvia, Greece, Germany, Kazakhstan and Japan successfully presented their collaborative research work in eleven interesting presentations which were moderated by Assoc. Prof. Eftihia Nathanail and Prof. Irina Yatskiv (Jackiva).